It was perhaps inevitable that the writer and critic John Ruskin, for so long Turner’s champion, would find Whistler’s work intolerable. The two held completely opposing views about politics and art: Ruskin was a socialist, while Whistler deplored the idea that art should be for everyone. Ruskin must have been dismayed to see Whistler painting Turner’s subject matter and using similar effects to beautify the industrial landscape on the Thames. He saw industrial pollution as symptomatic of moral degeneracy, while Whistler made no attempt to avoid references to the seedier side of London life. In 1877, Ruskin published a letter describing an exhibition at the Grosvenor Gallery which included Whistler’s work. 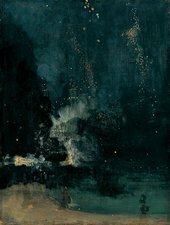 He complained in particular about Nocturne in Black and Gold: The Falling Rocket (shown in room 3): ‘I have seen, and heard, much of Cockney impudence before now; but never expected to hear a coxcomb ask two hundred guineas for flinging a pot of paint in the public’s face.’ Whistler decided to sue Ruskin for libel. The case was heard at the Old Bailey the following year. Ruskin’s doctors declared him unfit to appear in court, so Edward Burne-Jones took his place. Over the course of two days, many figures from the London art world gave evidence, while the newspapers discussed the meaning and value of art. Whistler’s painting had subverted the widely-held notion that art should have some moral or didactic purpose; indeed, to some it barely seemed to represent anything at all. 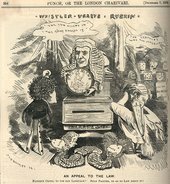 In the end, Whistler won the case, but was awarded only a farthing in damages. He became bankrupt and the Nocturnes, brought into the court upside down and lampooned in the press, were rendered unsaleable. The professional and emotional fallout from the case affected both Ruskin and Whistler for the rest of their lives.